Social Media Marketing is the art and science of nurturing positive buzz about your business on everything from Facebook to LinkedIn, Twitter to Google+, Yelp to Blogs, YouTube to Pinterest, Instagram to Snapchat, and so on and so forth. If using social media sites is akin to showing up at a party, then marketing via social media is akin to throwing the party. Newly updated for 2018, the Social Media Toolbook identifies hundreds of free tools and educational resources to help you master social media marketing. UPDATED for 2018. Newly updated with fantastic, new free tools, this edition covers content marketing, Pinterest, and Instagram as well as major sites like Facebook, LinkedIn, Twitter, and YouTube. FREE Social Media Marketing Tools. The Toolbook identifies hundreds of FREE social media tools – Twitter tools, Facebook tools, LinkedIn Tools, Google+ tools – all at your fingertips, for FREE.Social Media Toolbook – all up-to-date as of March, 2018! SYSTEMATIC: A Systematic Approach to SMM. Part of the JM Internet Group’s classes and courses on social media marketing, the Social Media Toolbook builds on the company’s ‘hands-on’ methodology of success. Subscribe – subscribe to our FREE EMAIL NEWSLETTER and you’ll get instant access to not only the SOCIAL MEDIA TOOLBOOK but the companion SEO TOOLBOOK and JASON’S DASHBOARDS of one click access to fantastic, free SEO and Social Media Marketing Tools. 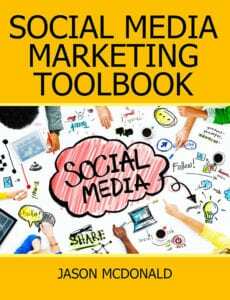 Social Media Marketing Workbook – buy the 2018 Social Media Marketing Workbook and the Toolbook is included for free! Go crazy! You can buy the Social Media Marketing Toolbook on Amazon for just $6.50! Social Media Marketing is the art and science of nurturing positive buzz about your business on everything from Facebook to LinkedIn, Twitter to Google+, Yelp to Blogs, YouTube to Social Bookmarking and on and on. This Social Media Toolbook identifies fun & free tools that can help you identify social media opportunities, manage your customer relationships, and measure your success.Wherever you are in your free Internet marketing journey – beginner, practitioner, or even expert – the Social Media Toolbook will delight you with a treasure trove of free tools for Facebook, Twitter, YouTube, Google+, LinkedIn and other major social media sites. Content – all linked to amazing, free SEO tool across the Web! Got questions? Call us at 510-894-6791 or send us an email.